Although the subject of this picture cannot be properly identified, it does resemble the 828 brick arch viaduct that was built to carry the London and Greenwich Railway. Constructed between 1833 and 1836, this was one of the country's first major engineering achievements. Expenses for this project totalled nearly one million pounds, a costly venture in 19th century England! 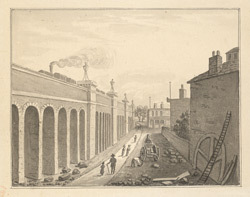 The railway still stands today, providing a five kilometre link between Bermondsey and Deptford.